Four days before Democrat Sean Eldridge lost his New York congressional bid in a landslide, Hillary Clinton released a robocall on his behalf. 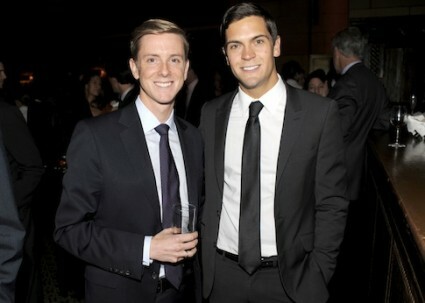 Eldridge’s husband, New Republic owner Chris Hughes, is now hosting a fundraiser for Clinton. The couple will host Clinton at their Manhattan home, about 100 miles south of New York’s 19th congressional district, where they bought a home just in time for Eldridge to run for Congress in the 2014 midterms. Republican Rep. Chris Gibson trounced him by 30 points. Hughes is a multimillionaire who made his fortune by being Facebook founder Mark Zuckerberg’s Harvard roommate. A co-founder of the social media giant, his most lasting contribution was Facebook’s "poke" button. Hughes is now bringing his considerable financial resources to bear on Clinton’s behalf, which could explain why Clinton went to bat for a lost cause of a candidate (Eldridge’s campaign was widely recognized as one of the cycle’s worst) less than a week before his all but certain defeat. "It’s certainly possible that her backing of Eldridge was with an eye toward a 2016 run and the fundraising potential of a connection with him and his husband, Chris Hughes," said Geoff Skelley of the University of Virginia’s Center for Politics. "Such transactional maneuvering is a fairly standard thing in the political arena—scratch my back and I'll scratch yours." Clinton and her husband were "good soldiers for the Democratic Party" during the midterms, Skelley noted, recording robocalls for a number of other candidates, including New York Democratic Rep. Sean Patrick Maloney. "But at the same time, the campaign trail also provided an opportunity for the Clintons to build new connections, and backing Eldridge despite his uphill fight was obviously a good way to get into the good graces of a very wealthy potential benefactor in Hughes," Skelley said. Clinton’s robocall cited Eldridge’s work on the board of abortion provider Planned Parenthood and his efforts at "protecting our environment." He vocally opposed Gov. Andrew Cuomo’s moratorium—now an outright ban—on fracking in the state, despite Hughes’ extensive investments in companies using the oil and gas extraction technique in neighboring states. "Sean is a strong and independent voice for New Yorkers, and if you give him a chance, he’ll fight for you every day in Congress," Clinton’s robocall declared. "He has a record of giving back to the community and investing in local small businesses to help them create more jobs." Eldridge’s investment work took place through a venture capital firm called Hudson River Ventures (HRV). Founded in 2011, the same year Hughes and Eldridge moved to the Hudson Valley, the firm invested in a host of local businesses and featured prominently in a number of Eldridge’s campaign ads. It was also a source of controversy. Eldridge’s critics said he used HRV has a de facto political operation, attempting to ingratiate himself with the community he deigned to represent in Washington after living in it for just a few years. Like the Clinton Foundation, HRV was seen as a way to meld Eldridge’s political and business interests. "He is using his money and experience as a big money political player to execute a strategy designed to buy favorable headlines and support to make up for the fact that he has no roots in the district, nothing substantial on his resume, and no ability to relate to middle class families in the Hudson Valley," a Republican working on the race said at the time. The upcoming Clinton fundraiser has also raised eyebrows among media watchers given Hughes’ ownership of the left-wing New Republic magazine. He has been widely criticized for management decisions that resulted in layoffs and resignations of veteran staff last year. "No one should expect a Chris Hughes rag to be impartial at this point," said Tim Graham, director of media analysis at the Media Research Center. "I think when Hughes bought the magazine after his stint in the Obama campaign, you would think this kind of activism would not be shocking." The magazine did not immediately respond to questions about whether it would disclose Hughes’ financial support for Clinton while covering the 2016 campaign. "It would be decent of TNR to mention such fundraisers when Hillary's campaign is evaluated in their pages," Graham said. "I can't say I expect it."